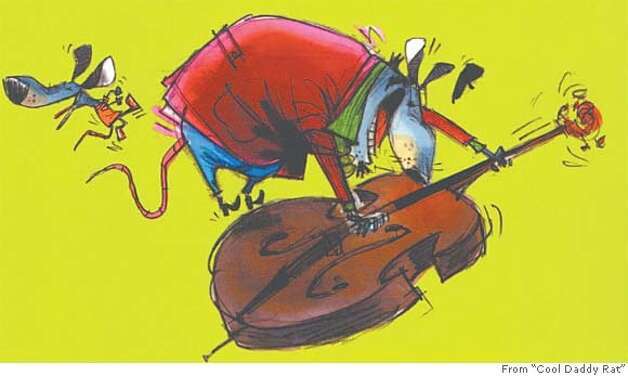 Just in time for Father’s Day comes the jazzy picture book Cool Daddy Rat by Kristyn Crow, illustrated by Mike Lester (Putnam; 32 pages; $16.99; ages 4-8). It tells the story of a jazz musician who arrives at his gig one night only to discover that his son, Ace, has sneaked into his stand-up bass case. So Daddy takes him along on his rounds all over New York City. The hep-cat language and vibrant illustrations with a sketchbook look are equally exuberant, giving the story so much momentum it seems more like an animated cartoon than a book. You couldn’t find a hipper father-kid story to enjoy together. They resolve to change, but when one dances her last dance, another sings her last song and another paints his last picture, the professor is so moved he’s transformed. The story should resonate with little ones constantly reined in for their own safety. And the triumph of self-expression and the will to risk everything for art are exhilarating.